Our company manufactures and provides a competitive range of Distilleries Vessels that are used to store liquid solutions, chemicals, raw materials and pharmaceutical raw materials. These products are highly appreciated for their high tensile strengths and we offer them at client friendly prices to the clients. our products are manufactured using high quality raw materials and advanced technology and available in a variety of specifications. 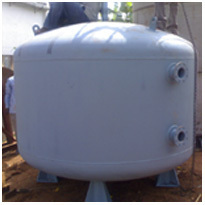 We are manufacturers of a wide range of ss/ms industrial process equipment, pressure vessels and storage tanks. Being durable and resistance to corrosion, these are widely used in distilleries, breweries, and chemical and pharmaceuticals industries.